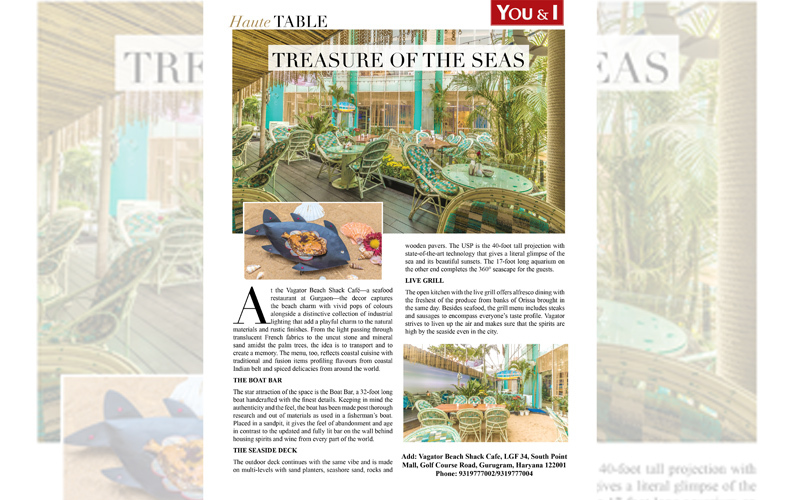 At the Vagator Beach Shack Café—a seafood restaurant at Gurgaon—the decor captures the beach charm with vivid pops of colours alongside a distinctive collection of industrial lighting that add a playful charm to the natural materials and rustic finishes. From the light passing through translucent French fabrics to the uncut stone and mineral sand amidst the palm trees, the idea is to transport and to create a memory. The menu, too, reflects coastal cuisine with traditional and fusion items profiling flavours from coastal Indian belt and spiced delicacies from around the world. The star attraction of the space is the Boat Bar, a 32-foot long boat handcrafted with the finest details. Keeping in mind the authenticity and the feel, the boat has been made post thorough research and out of materials as used in a fisherman’s boat. Placed in a sandpit, it gives the feel of abandonment and age in contrast to the updated and fully lit bar on the wall behind housing spirits and wine from every part of the world. The outdoor deck continues with the same vibe and is made on multi-levels with sand planters, seashore sand, rocks and wooden pavers. The USP is the 40-foot tall projection with state-of-the-art technology that gives a literal glimpse of the sea and its beautiful sunsets. The 17-foot long aquarium on the other end completes the 360° seascape for the guests. The open kitchen with the live grill offers alfresco dining with the freshest of the produce from banks of Orissa brought in the same day. Besides seafood, the grill menu includes steaks and sausages to encompass everyone’s taste profile. Vagator strives to liven up the air and makes sure that the spirits are high by the seaside even in the city.